Knives with keyhole handles are hot and in the new BLADE®, on most newsstands NOW! 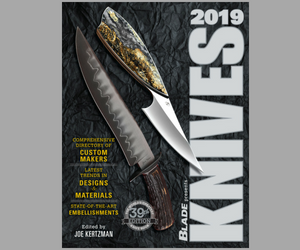 Keyhole integrals, knives made in the USA, movie fantasy swords and much more highlight the new BLADE®, on most newsstands now! ABS master smith Rodrigo Sfreddo appears to have been the first to make knives with the integral-style handle in the shape of a keyhole where the handle material and fittings meet, and other ABS bladesmiths have taken the concept and run with it. ABS master smith Ron Newton’s modified keyhole integral graces the cover of this issue and Mike Haskew’s story examines the concept in detail. With Independence Day a couple of weeks away, we thought a story on some of the knife companies who make their knives in America would be a great way to celebrate the 4th. And, in the realm of blade grinds and finishes, we offer stories on what to look for in the best blade grinds and the latest look in blade finishes—including those used on the swords of the hit movie, The Hobbit™: An Unexpected Journey. There’s much more, including part two of both Ed Fowler’s “Quest For Cut” and the series on Plaza Cutlery observing its 40th anniversary of selling knives in the South Coast Plaza Shopping Resort in Costa Mesa, California; some of the latest in damascus patterns on custom knives; Eric Ochs’ chute knife flipper; “The Knife I Carry”; and much more, all in the latest BLADE. Previous articleRandall Knife Collectors Club Wants You! Next articleIvory Ban Meeting June 24: Act NOW!